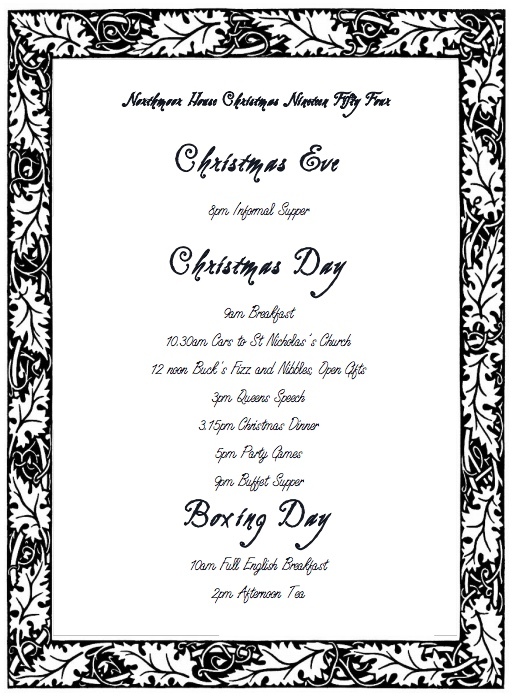 Because we had framed our event as a Christmas family get together, that meant that without having to communicate with the players, there was already an event structure in place. 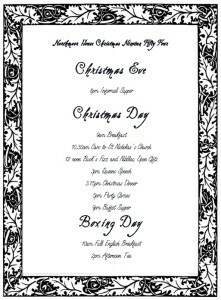 People understand the narrative of Christmas – the family gathering on Christmas Eve, the opening of presents on Christmas morning, the Queen’s Speech, Christmas dinner, crackers, Christmas pudding etc. We did leave a note on every player’s bed as they arrived formalising some of this; but from our point of view it meant the game didn’t feel like we’d imposed an external artificial structure – Christmas naturally gives us that progression. Friday Night – Two deaths, and some haunting, but no full ghostly manifestation. Saturday Morning (Christmas Morning) – Players discover that the house is isolated by flooding. Get up, have breakfast, improvise church service. Saturday Evening/Night – Serious haunting kicks off, full ghostly manifestations. Sunday Afternoon/Evening – Players resolve the story and see the final scene played out. This event had various layers of story and interactivity that all conspired to keep things busy for the players, even when we weren’t outright providing something for them to do at any point. The players could engage with any or all of these layers at any one time. The house was scary purely on its own merits, and players could spend a lot of time simply exploring the house and grounds. We gave the players access to radios – playing the BBC Light Programme – so that they could listen in to what was going on in the wider world, including the news. More on the radios here. We also gave them access to a 1950s telephone, so they could call out to, for example, the police station, or the post office, or could receive calls from their stock brokers. We had peppered the house with clues – documents, letters, props, paintings, books, all sorts of things. These gave the house personality and allowed the players to spend time exploring the stories of the ghosts. The staff had their own stories, some of which interwove with the stories of the players. The players could engage with these or not as they wished. The characters all had their own aims, problems and secrets, and when not doing anything else would be working at trying to resolve those problems. As said above, the structure of Christmas significantly drove forward and shaped the way the players spent their time over the weekend. Dealing with and investigating any ghostly manifestations was a large part of play; as was seeing if there was a way to lay the ghosts to rest. The underlying story, that of Nicholas, Catherine and Edmund, lay behind and fundamentally shaped everything.